Jensen Gym now offers the Microfit System – a machine that tests cardiovascular fitness, strength, body fat and blood pressure. To book time, contact Mr. Sorbello at (253) 966-3757. 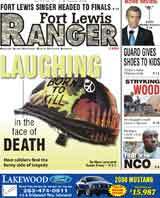 The tip of the Army’s spear just got sharper, and once again Fort Lewis is at the center of that. Soldiers on post are testing the new Land Warrior System. “Lessons learned from what is going on in today’s war on terror are key,” said General Dynamics’ Kevin Hyneman as soldiers from C Company, 4th Battalion, 9th Infantry Regiment trained with the new system. “This system increases situational awareness, survivability and agility at the squad level,” he added. The Land Warrior, or LW, is a $170 million wearable, modular, integrated fighting system for infantry soldiers. LW combines computers, lasers, geolocation and radios with the soldiers’ mission equipment to substantially improve soldiers’ close combat tactical awareness. “The system improves situational awareness,” said Staff Sgt. Thomas Martin, C Company, 4th Battalion, 9th Infantry Regiment. “We can see where every soldier is,” he added. The system is not without its challenges. “We’re still working out the kinks,” said Gen. Richard Cody, Army vice chief of staff, during a visit to the post on Tuesday. While on post, Cody visited a simulation-training center for medics, a child care and parenting education program, and a site where lessons learned in Iraq are sent back for analysis and incorporation into training. The LW system implements some of the lessons learned from the battlefield. One feature of the system is a monocular eyepiece that contains a small computer screen that allows a soldier to keep track of the whereabouts of other soldiers. “Command and control are vital in an urban environment,” added Martin. “This system helps in that,” he added. Another feature is a small camera mounted under an M-4’s barrel that relays images to the eyepiece. “I can take my weapon, hold it out to look around a corner and use the camera to see what is out there before I step around the corner,” said 1st Sgt. Jonathon Seegrist, 4th Battalion, 9th Infantry Regiment. “This system is as significant and important as rifled barrels were over smooth bore barrels,” pointed out Col. Ernest Forrest of the Army’s Training and Doctrine Command, or TRADOC. “This system will change how we fight,” he added. Two of the elements to fighting well are trust and teamwork. “Trust in each other, your equipment and your leadership,” Cody reminded the soldiers. 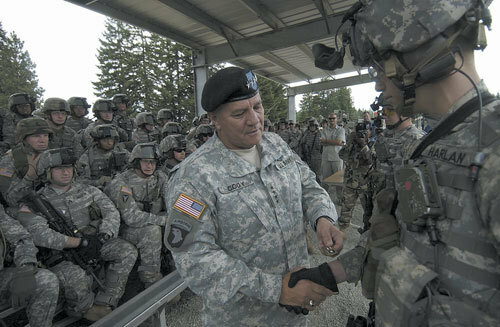 In a follow-on 20-minute give-and-take with the soldiers, Cody reminded them that they have been provided the best in training, leadership and equipment. Pulling a stack of souvenir coins out of his pocket, Cody had the youngest soldiers — two 18-year-olds — come forward and pick soldiers they thought deserving of the coins. “Don’t be bashful,” said Cody to one of the soldiers. “I’m here, and I’ll make sure nothing happens to you,” he added with a smile. On a more serious note, Cody noted that the regiment’s soldiers are a special breed, that they are the first all-voluntary Army to go into combat in Afghanistan and Iraq, which has lasted longer than the fighting did in Europe during World War II. “You volunteered for this; you are making something of yourselves,” continued Cody. “Train hard, and take care of each other,” he added.